Brendan heard the call of natural history early on, when he first peered through the foggy glass of a tarantula’s terrarium in his kindergarten classroom. While others enjoyed beautiful birds, graceful whales or majestic trees, his fascination with all things biological was sparked by a hairy, venomous arachnid. Soon enough, his bedroom shelves were filled with natural history books, snake skins and terrariums. Brendan later pursued his scientific interests at the University of California, Santa Cruz, where he earned his B.S. in ecology and evolutionary biology. While studying tarantula courtship abroad in Costa Rica’s cloud forests, he reaffirmed the idea that he loved talking and writing about science more than practicing it. Once home again in Santa Cruz, he completed the Science Communication Program at UCSC in 2016. He enjoyed roughly two years of freelance science communication, working with scientific nonprofits and digital magazines to highlight new findings in geophysics and biological science before uniting with the Museum. Today, Brendan is the Museum’s Community Relations Manager. He enjoys promoting the Museum’s extensive programming and events, and highlighting Santa Cruz’s rich natural history through the Museum’s social media channels. He also lovingly cares for the Museum’s oldest resident: Prometheus, the California kingsnake. In his spare time, Brendan teaches jiu jitsu ­­— a martial art whose aim is to incapacitate through choke holds and joint locks — in the Santa Cruz Mountains. 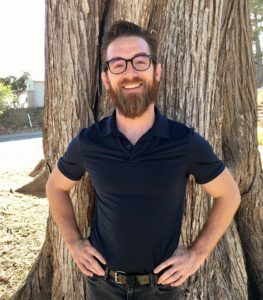 He continues to report scientific findings as a freelance science communicator, and adores hiking and herping throughout the Bay Area with his dog, Baph, and partner, Julia.